Hello, just curious to see if others are seeing this. Tried to search for the issue and did not come up with anything. I did a factory reset of my Line 6 Spider IV 75 combo amp and FBV Shortboard pedal/controller. Both of these devices are in fully working order and fully updated to the latest firmware. 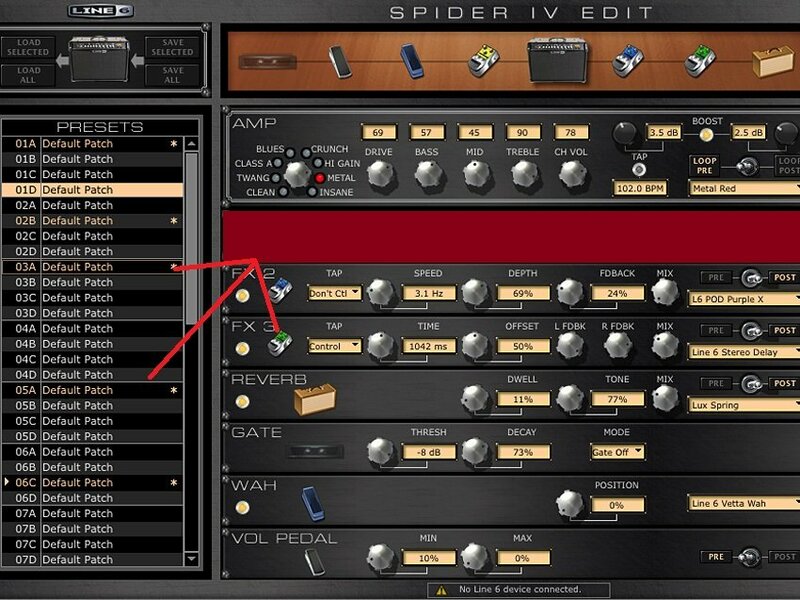 In using Spider IV edit software everything connects just fine however certain presets (not all) error out on the edit software and one or more FX slots are now SOLID RED. Restart everything and the same thing happens with those presets. It is clear that the preset is the issue, however once you run into this ALL presets ("good" or "bad") are shown in SOLID RED now. There is no audio issues but its very hard to get this cleared up and returned to normal once it happens? Anyone else seeing this. I attached a screenshot of the issue (grabbed from the internet so ignore the preset names). I ask because I wanted to go through every preset and save a copy to my computer for backup. This is proving to be harder to do when this issue comes up.